Being a cheerleader for innovation or change is great. Implementing specific strategies to increase the likelihood of success is essential. 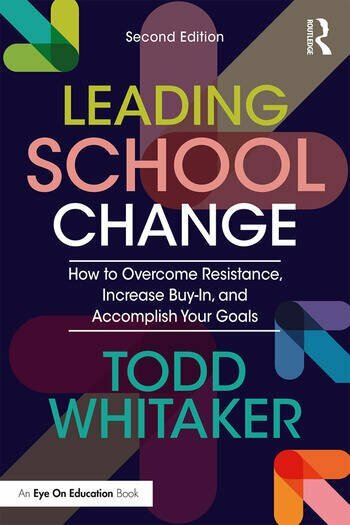 In this key book from bestselling author and speaker Todd Whitaker, you’ll discover clear ways to lead and manage school change by setting realistic goals, planning your approach, and tracking your progress. You’ll also find out how to work effectively with others, overcome resistance, and gain widespread acceptance. Whether you are a district leader, building leader, instructional coach, or teacher-leader, you’ll come away from this book with all the tools and inspiration you need to make a positive, immediate, results-oriented change with the support of your staff. Bonus: This enhanced second edition includes a special Action Plan and Implementation Guide. The Action Plan will help you apply the ideas, step by step, to your own situation. The Implementation Guide can be used for independent reflection or as a study guide with book groups or professional learning communities. Chapter 3: Make Sure the First Exposure Is Great! Todd Whitaker is a Professor of Educational Leadership at the University of Missouri. He is a leading presenter in the field of education and has written more than 40 books, including the national bestseller, What Great Teachers Do Differently.